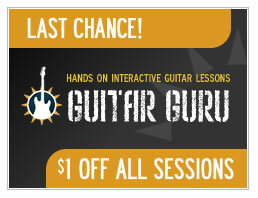 This is your last chance to take $1 off every Guitar Guru Session we have in our catalog. Sale ends midnight on Sunday, May 31st. We’ve got some great Sessions we’ve added over the past, few weeks to help you on your quest to learn guitar. Whether you’re into country songs like When You Say Nothing at All by Alison Krauss or modern rock Sessions like She Talks To Angels by The Black Crowes, we have hundreds of your favorite songs to choose from including your rock-and-your favorites. Choose Sessions by The Rolling Stones, Led Zeppelin, The Eagles, The Beatles and many more! and the hot new song Use Somebody by Kings of Leon. Thanks to everyone who got their Guru on this past month. We hope you’re enjoying our Guitar Guru Sessions and you’ll get a lot of use out of the guitar tab that’s included with each Session. Click Here to Browse our Guitar Guru Session Store Page. The average price of a Session for Guitar Guru is $6.95, and each song comes with a corresponding guitar tab that is yours to keep. Every Session from our inventory is automatically discounted before you check out, so you’ll see the price (e.g. $5.95 on Sale!) when you select the Session you want to purchase. Stay tuned for more hot, new Sessions for the songs you want to learn on guitar! If you haven’t tried out Guitar Guru yet, check out this YouTube! video describing how it works on a PC! I cannot find the normal cost for guru sessions anywhere. What is the normal cost? $1 off of what? The price of the Guitar Guru Sessions has been automatically adjusted on each Session. The majority of the Sessions are $6.95, but there are a few that are more expensive. As you know, the Session also includes the guitar tab as well. Can’t find price any where. Can figure out how to buy guitar guru. All I know is that I get $1 off. Thanks for your comment. I updated the post to be more informative.